Description: Business card holder made from Brazilian cowhide leather. 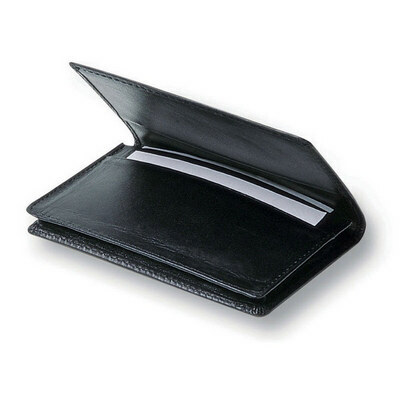 Features: Internal pockets and 10mm gusset and holds approximately 20 business cards. ?Pocket size 10.5cm (w) 5cm (h) Packaging: In a polybag and presented in a plain black 2 part gift box. ?Packaging Size: 120mm(h) x 80mm(w) x 15mm(d) Colour: Black. Material: Brazillian leather cowhide Product Size: 110mm(w) x 70mm(h) with 10mm gusset Freight details : 250 per carton, 16kgs, 45 x 21 x 68cms; Decoration Type(s): Colour Print / Deboss / Debossed Foil / Foil Stamp / Full Colour Print Decoration Area: Pad: 40mm(w) x 30mm(h). ?Other Methods: Contact your decorator for applicability and size. Price includes : 1 Colour 1 Position Print. Setup is included.